Juicy raspberries and dark chocolate come together in this simple, crowd-pleasing coffee cake. Why hello there pretty cake. Every Christmas morning, my mom wakes up before everyone else to bake this gorgeous coffee cake. We snack on the coffee cake as we sit around the tree to open gifts. It keeps our tummies full until we sit down to big brunch a couple hours later. It’s the kind of cake you make that morning and enjoy on the same day. I like to pick off the raspberries first and then eat the rest of the cake. I am completely in love with raspberries and dark chocolate together! Have you tried my Dark Chocolate Raspberry Banana Bread yet? The recipe is baked in a small 8×8 or 9×9 inch baking pan. 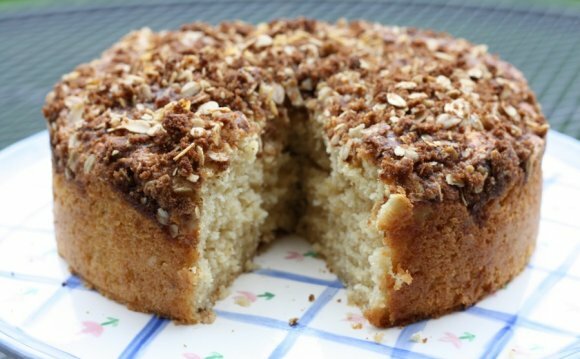 This size is perfect for me – I don’t need 23 extra slices of coffee cake laying around! The cake is so soft and buttery – but really, there’s only 1/2 stick of butter in the actual cake recipe. It’s the buttery streusel layered in with the batter that makes each bite literally melt in your mouth. There are layers in this coffee cake? Yes. Batter -> buttery almond streusel -> raspberries & dark chocolate chips -> more batter -> more streusel -> more raspberries & dark chocolate chips. Layer upon layer of awesome. Your new favorite coffee cake is a piece of cake (ha!) to make. Prepare the streusel first – 3 Tablespoons cold butter, 1/4 cup sugar, 1/4 cup all-purpose flour, and 1/2 cup slivered almonds. You may leave the almonds out, but I love the extra texture they gave the cake. Mash the butter up a bit with a fork before mixing with the rest of the ingredients. You want the mixture to be crumbly and chunky. Next is the very simple batter recipe. And when I say simple, I mean it. Literally put all of the batter ingredients into a large mixing bowl and beat with a hand-held mixer. That’s it, you’re done. Pour half of the batter into the baking pan, layer with half of the streusel, then half of the raspberries and chocolate chips, then the rest of the batter, then the remaining streusel. I sprinkled a few more chocolate chips and raspberries on top of the cake for looks. I like pretty cakes. Eat the cake the day it is baked if you can. I’ve noticed that the raspberries on top sink down a bit into the cake after the first day. We store the cake at room temperature. Get ready to dig right in to the butteriest, most outrageously layered chocolatey raspberry cake you’ll ever taste. The texture is moist and soft and each bite will leave you wanting more. Between the almond streusel, the dark melty chocolate, juicy berries, and soft buttery cake – there is something new in every last crumb. I ate mine with a mug of chai tea in my fuzzy slippers curled up on the couch. Now that is what I like to call Sunday morning perfection. Warning: your stomach will be growling as you smell this cake is baking away in the oven. Now go enjoy the prettiest, easiest coffee cake in all the land. I’m always sad when the last piece is snatched away! Preheat oven to 350F degrees. Spray 8 or 9-inch baking pan with nonstick spray. Set aside. Make the streusel first by gently mashing up 3 tablespoons of cold butter in a small bowl. Add 1/4 cup all-purpose flour and 1/4 cup sugar and mix around with a fork. You want it to be chunky and crumbly. Add the almonds. Set aside. In a large bowl with a handheld or stand mixer, add 2 cups all-purpose flour, 3/4 cup sugar, 1/4 cup butter, buttermilk, vanilla extract, baking powder, salt, and egg. Beat on low until everything is sufficiently combined - about 2 minutes. Scrape down the sides of the bowl as needed. Do not over-mix. Spread half of the batter into the prepared baking pan. Layer with half of the streusel, then most of the raspberries and chocolate chips. Repeat with the rest of the batter and the streusel. Top with remaining raspberries and chocolate chips.